BrightXpress is a simplified mobile app development platform for creating enterprise-grade mobile data collection apps in minutes. It comes with its own drag-and-drop app builder and a powerful easy-to-use server product for data integration at the backend. Our core focus is to reduce the complexity of creating mobile business apps. From front-end mobile app development to backend integration are clicks away for those with minimum or no programming experience for cloud or on-premise deployments. White labelled (branded) mobile apps can be created for the Android platform in seconds by using our APK tool. Download BrightXpress for free and start creating your mobile apps today ! Create mobile apps in minutes. Absolutely no programming! Just drag and drop forms and configure them. Create apps with ease by leveraging the power of BrightXpress and eliminate headaches and increase productivity. BrightBuilder Mobile Application Designer is all you need to create mobile apps. With its drag-and-drop form designer, no previous programming experience is required to develop powerful mobile data collection apps. Deploy your cross platform apps to offline capable rich forms engine running on major mobile platforms including Android, iOS and Windows. Take advantage of native hardware capabilities including camera, GPS, signature capture, barcode readers and more. Business data can easily be mobilised to mobile devices with BrightServer. BrightServer handles the communications with the remote field devices. With the built-in integration engine, data sent by mobile devices can easily be distributed back to business systems. With a full transactional built-in synchronisation engine and application distribution and update tools, mobile apps can easily integrate into any business system. I am not a programmer, can I use BrightXpress to create my own mobile data collection app? Yes, BrightXpress comes with the Business Application Designer which empowers non-programmers to create mobile apps just by using drag-and-drop and configuration. At no stage programming is required. It is designed for users with no programming experience! With the built-in BrightBuilder mobile app designer tool, you can create apps with minimal programming expertise. BrightXpress offers a simplified, cross-platform, mobile programming environment to design, develop and deploy mobile apps and hides many of the complexities of mobile device programming. Using BrightXpress, none of this is necessary. You don’t need XCode on a Mac for iOS, or a special SDK for Android, or Visual Studio for Windows. 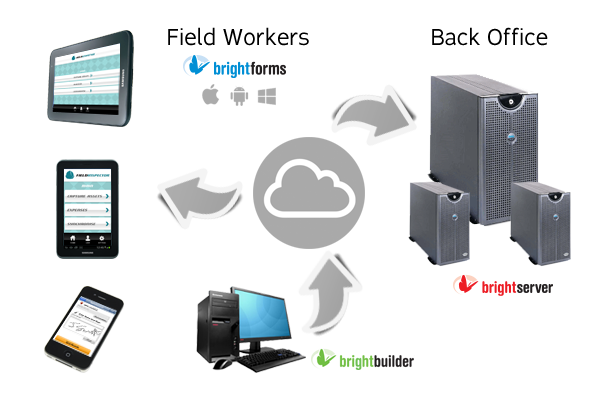 BrightXpress can target all these platforms without the need for any additional software. With many out-of-the-box features, the BrightXpress platform frees you from worrying about many of the details of mobile app development, and allows you to concentrate on creating the mobile solution that the users require. Free to use. Up to 5 mobile workers.